Since I am starting out my SP studies again I figured I would do a post on basic MPLS VPNs with VRFs and just use static routes. These are some of the base fundamentals in a MPLS VPN deployment, and from here you can quickly build out and add complexities if you wish. What I will cover here is VRF, RD, LDP, and MP BGP configurations and I will start by defining and explaining the technologies. Virtual Routing and Forwarding, or VRF for short, is a technology that allows a router to have multiple instances of a routing table at the same time. These routing tables co-exist on the router, but yet are segmented and independent of each other. An analogy would be Server virtualization. You can have a single server running VMWare, and then under that have multiple instances of Windows running independently of each other. You can configure those servers to talk to each other, or completely isolate them away and they will have no knowledge of each other. Now onto the fun stuff – Multi-protocol BGP with regards to VPNv4 and VRF. As you are probably already aware BGP can be a very powerful protocol – and MPLS VPNs take advantage of this. Right from RFC4577: Many Service Providers offer Virtual Private Network (VPN) services to their customers, using a technique in which customer edge routers (CE routers) are routing peers of provider edge routers (PE routers). The Border Gateway Protocol (BGP) is used to distribute the customers routes across the providers IP backbone network, and Multiprotocol Label Switching (MPLS) is used to tunnel customer packets across the providers backbone. This is known as a “BGP/MPLS IP VPN”. 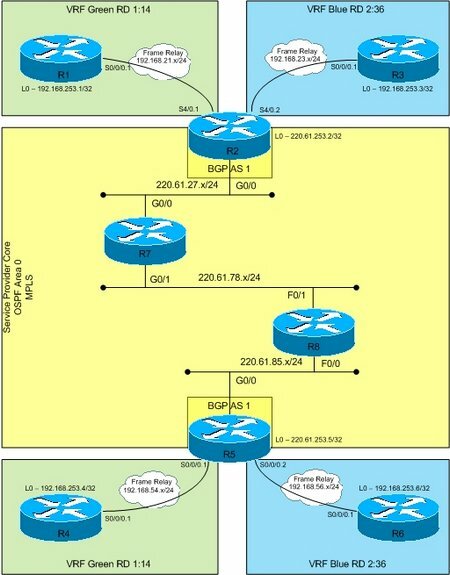 Now the VRF part of BGP comes into play as it provides the ability to redistribute between BGP and the defined customer VRF. Your PE to CE relationship can be any routing protocol you choose – RIP, OSPF, EIGRP, Static, BGP, etc and – based on the RD defined – you have the ability to redistribute the routes between your protocol of choice and the BGP VRF. So, enough of the typing and reading – lets get onto the configuration example. Below is a diagram of the network that I will build out and test. I have basically 3 networks here: VRF Green, VRF Blue, and the yellow Service Provider backbone network. For the PE to CE protocol we will configure static routes, keeping things simple. For the Service Provider network we will use OSPF Area 0, again keeping things simple. For VRF Green we will use RD 1:14 and for VRF Blue we will use RD 2:36. The Service provider network will also run MPLS LDP and we will have a MPBGP peering between the loopback of R2 and R5. First, lets build the SP core network R2, R7, R8, and R5 and configure OSPF. We will hold off on the MPLS portion for now, just the basic OSPF network to make sure that we have full connectivity. Cool, now that we have the basic SP backbone connectivity we can add the MPLS to the picture. All that we have to do is enable MPLS IP on the interfaces. But as a safety measure, it is smart to set the protocol to LDP (Label Distribution Protocol) to be sure. See that, we have LDP neighbored up with R2! …and R8 neighbored up with R7. We can see that R8 is neighbored up and has all the addresses bound to that neighbor. We are good to go! You might also notice that the only Addresses bound to the peer are the ones that are not in a VRF. Now that we have LDP configured and enabled, lets look at the mpls forwarding table to see if we have labels. Looking good! Now, lets get the PE to CE configuration done for the Green VRF. First we need to define the VRF, in this case Green. Now we can assign our Route Distinguisher. This is usually the same for all instances of the VRF across the Provider network. We will now tell the VRF to export and import anything with a tag of 1:14. Using the both command implies import/export. Now onto the Serial interface. First we configure the interface for Frame Relay. Now we can configure the sub-interface for point-to-point connections. Since R1 is not part of the PE, there are no VRFs necessary. All that we need to do is configure it like we normally would. Since we are not running a routing protocol here, we will need to configure a static route pointing towards R2. That worked! Now lets add a static route on R2 for R1’s loopback interface. There we go! Now onto the rest of the routers for the Green VRF. When you place an interface into a VRF, any existing IP address is removed. You will need to re-enter the IP address again. Just like R1, there is no VRF configuration on R4. Just a normal router. Now onto the Blue VRF. The commands are the same, just a different RD and VRF. We will configure the necessary static route for the Blue VRF as well. Now before I go on lets test PING from R1 to R3, R4, and R6. We have configured a default route on each of the CE devices, so this should work – right? Nope, nobody can ping anyone, curious. This is because even though we have created VRFs with the same RD we have not configured any routing between the two PE routers, R2 and R5. This is where MBGP comes into play. Lets configure the basic BGP peering via loopbacks between R2 and R5. There, we have BGP neighbors up. Ok, basic BGP peering is up, now we can create the VPNv4 connection between R2 and R5 so that we can pass the Route Targets (RT) between the peers. We will also create the associated ipv4 address-family VRFs and redistribute the static and connected routes. Now we can create the VPNv4 connection between R2 and R5 via the address-family commands. We need to activate the neighbor. And tell the route to send the RT tags along as well as any other communities. By default the router may add send-community extended, but if you need to also send standard later on you will need to change it. It is just easier to enable the sending of standard and extended. *>i192.168.21.0 220.61.253.2 0 100 0 ? *> 192.168.54.0 0.0.0.0 0 32768 ? *>i192.168.253.1/32 220.61.253.2 0 100 0 ? *> 192.168.253.4/32 192.168.54.4 0 32768 ? *>i192.168.23.0 220.61.253.2 0 100 0 ? *> 192.168.56.0 0.0.0.0 0 32768 ? *>i192.168.253.3/32 220.61.253.2 0 100 0 ? *> 192.168.253.6/32 192.168.56.6 0 32768 ? There we can see the traffic traversing the MPLS network as expected. Nope, and that is what we do expect to see. R3 and R6 are in the Green VRF and not the Blue. They are separate, so we have full connectivity between the appropriate VRFs while the other VRFs are not reachable. Basically below is a diagram of what is happening. The Green VRF is kept separate the entire time from the Blue VRF. Even though the transit the same PE routers (R2 and R5), the VRF and RTs are what keep the routes separate and unique. One last thing to look at, the routing table on the SP backbone network, here R8. As you can see they have no routes to the customer network, none at all. The customer network is completely separated from their network.